With three days in Geneva, sample the best of Swiss traditions, innovative culture, and dramatic scenery. The lakeside city is a great destination in its own right, but easy access to the surrounding Alps makes it a perfect jumping-off point for trips to snowy peaks and storybook villages. Here’s how to make the most of your time. Geneva makes headlines with futuristic science, but start with the cobblestone streets and historic landmarks of the Old Town for a taste of the city’s heritage. There’s a maze of streets here, so stay oriented by joining a guided tour—you’ll get the stories behind each of the historic landmarks along the way. Highlights include Bourg-de-Four Square, Cathédrale de St. Pierre (St. Peter’s Cathedral), and old-world architecture; when choosing a tour, consider options such as walking tours, Segway tours, and hop-on hop-off tickets that offer extra flexibility. Round off the day with a very Swiss feast of traditional fondue in an Old Town restaurant. A long list of institutions keep Geneva at the forefront of art, science, and global policy, so pick out one or two that catch your interest. Science-buffs shouldn’t miss CERN, a physics research center that’s just out of town, while culture hounds can head to the Geneva Ethnological Museum. Browse the gleaming, precise watches at the Patek Philippe Museum; take a tour of the UN at the Palais des Nations; or visit the International Red Cross and Red Crescent Museum. After a day inside, take in the sunset on Lake Geneva, whether you hop a local ferry or book an elegant dinner cruise. As a major gateway to the Alps, Geneva is a great home base for visiting the high mountains, with top destinations just a day trip away, such as Gruyères in Switzerland and Chamonix, Mont Blanc, and Annecy in France. Options range from adventurous trips up snowy peaks to tasting tours through traditional villages. If you’re looking for history, consider Neuchâtel in Switzerland or Annecy in France, medieval destinations with perfectly preserved architecture. Cheese lovers can take a deep dive into Switzerland’s most famous wedges at Gruyères, while the French town of Chamonix is the undisputed hub of hiking, climbing, and mountaineering in the surrounding peaks, including Mont Blanc. Discover the allure of the European Alps on a full-day trip to Chamonix and Mont Blanc, the highest mountain in Europe, from Geneva. With a guide, travel through the splendor of the countryside to Chamonix, a picturesque Alpine town, and ascend to the Aiguille de Midi peak in a modern cable car. Capture sweeping vistas of the French, Italian and Swiss Alps on camera and the take a scenic railway ride to Montenvers, home to Mer de Glace, the most famous glacier in France. Opt to include a 3-course lunch in Chamonix to enjoy an appetizing addition to the tour. Discover Geneva’s main attractions by Segway and cruise around the city the eco-friendly way, by personal transporter. 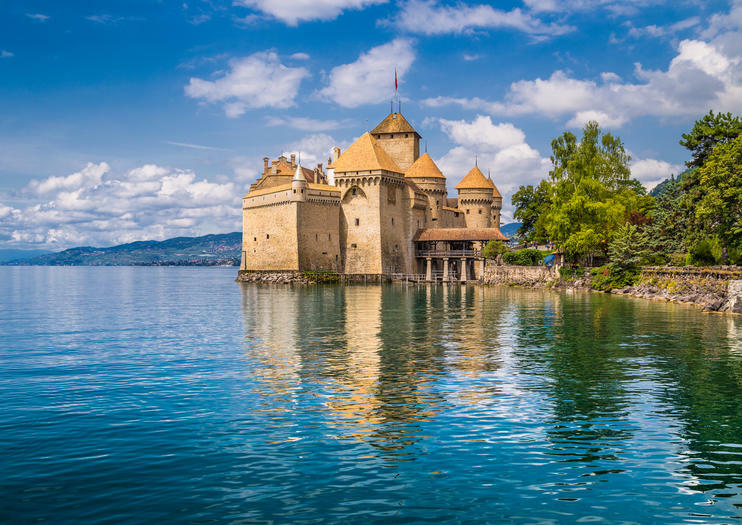 Follow a professional guide along the banks of Lake Geneva for splendid water views and pause to gaze at Château de Penthes (Penthes Castle). Motor past Cathédrale de St-Pierre (St Pierre Cathedral), the Reformation Wall and the Brunswick Monument along the cobbled streets of Old Town. Numbers are limited to 12 people for a small-group experience during this 3.5-hour Segway tour of Geneva. Geneva, Switzereland, is home to the European headquarters of the United Nations and is one of Europe’s greenest cities. This tour hits the highlights via bus, mini train, and on foot. You’ll see the city’s most famous attractions, including Saint Peter’s cathedral, Place Bourg-de-four, the arsenal and the town hall. You’ll also be treated to a boat ride on Leman Lake. The tour allows participants to immerse themselves in Geneva’s rich culture and history. Ski in Chamonix on a hassle-free day trip from Geneva that includes everything you need to zip down the slopes with ease: ski rental, lift pass and transport. Choose the half-day pass to enjoy a ride on the Aiguille du Midi cable car plus an afternoon on the slopes. Or upgrade to the full-day pass for a full day of skiing. Both options cover Chamonix’s acclaimed Brevént or Grands Montets ski areas. Geneva is a sleek and modern-thinking city, but evidence of its colorful history can still be seen—if you know where to look. On this sightseeing tour, explore Geneva by traditional trolley and mini-train, and see a historic side of the city that many visitors miss. With on-board commentary, travel through the city streets, enjoy sweeping views over pretty Lake Geneva, and uncover 2,000 years of settlement and civilization. Whether you have a limited time in Geneva, or just want to explore the city in a unique way, this panoramic tour bus allows you stunning views of the city from every angle. Discover this cosmopolitan international city and its most iconic sights, like the beautiful Lac Leman, United Nations, Geneva Flower Clock, and Parc des Eaux Vives.